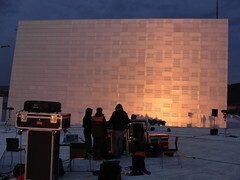 An outdoor event on the roof of the opera house in Oslo, with two short concerts using video projection. 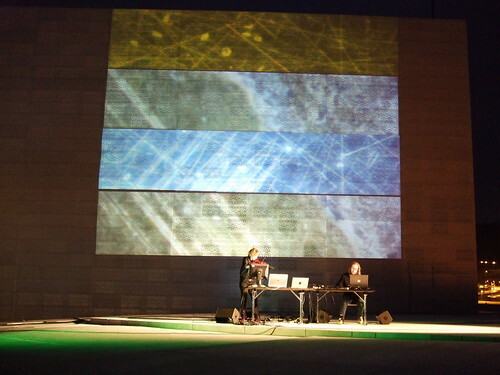 This was a projected iniated by electric violinist Victoria Johnson, which is currently a research fellow at the National State Academy of Music in Oslo. The white marble opera house designed by Snøhetta has become one of the main tourist attractions in Oslo, with a nice view over the harbour and the city. It is almost like a iceberg that you can climb onto. Standing on the roof, listening to the sounds of sirens and seeing something which could almost be a skyline (actually 90% of the tall buildings in Oslo are just behind the opera house), you could get the impression that Oslo is actually a big city! In short, a quite spectacular setting. The concert consisted of two compositions by Knut Vaage, Electra and multimorf, performed by Johnson and Thorolf Thuestad. Ellen Røed has made a beautiful volcano timelapse video for Electra, and I did a live impro video for multimorf. 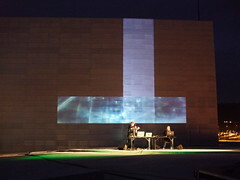 We decided to do the concert in front of one of the walls of the stage tower, which is about 30x15m. 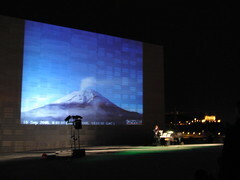 We managed to cover one half of the wall, using a 15000 ansilumen projector. 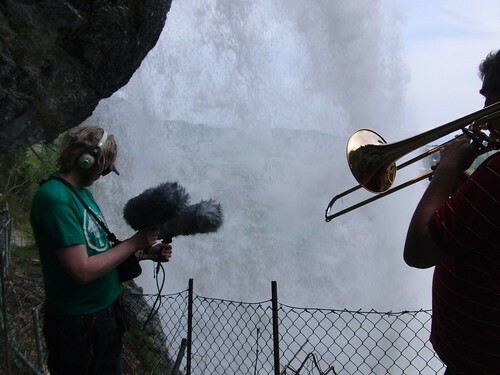 We have performed multimorf twice before, in very different contexts: First with a big brassband at a concert venue in Bergen, then a stripped down version for electric violin,electronics and live video at the Concert Hall in Oslo. My video has changed from venue to venue, trying to adopt to the setting. 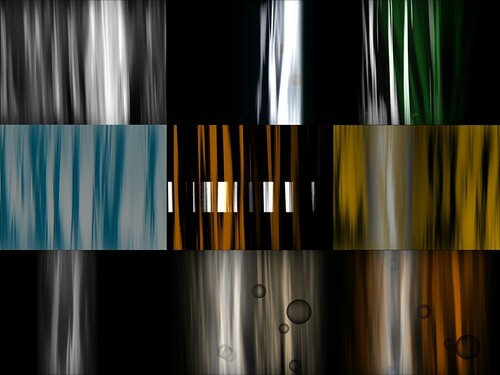 The only connection between the three performances is a series of microscope images from brass instruments, which I made for the original version. 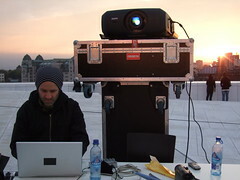 For the outdoor concert on the opera roof I wanted to have a more direct relation to the surface we projected onto, a beautiful aluminum wall with a relief pattern made by the artists Løvaas & Wagle. 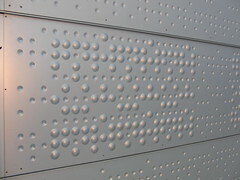 The 30x15m wall consists of panels of the relief patterns and I decided to use my videoprojection tools software to mask rows and columns of these panels. Working outside with a short timeframe means a lot of practical issues needs to be solved, and this left very little time for my slightly ambitious masking project. It gets dark quite late in Norway in the spring, so the concert was to start at ten in the evening. Only at around nine was I able to see enough of the projection to actually start masking the image, so everything needed to be done in less than an hour. On top of this it was freezing, so I was literally shaking while I was trying to do very precise masking. In the end, it turned out quite nice, and triggered some ideas for a project I am planning to do next year. All photos from multimorf and of me is taken by Ellen Røed, thanks! more images from the event.